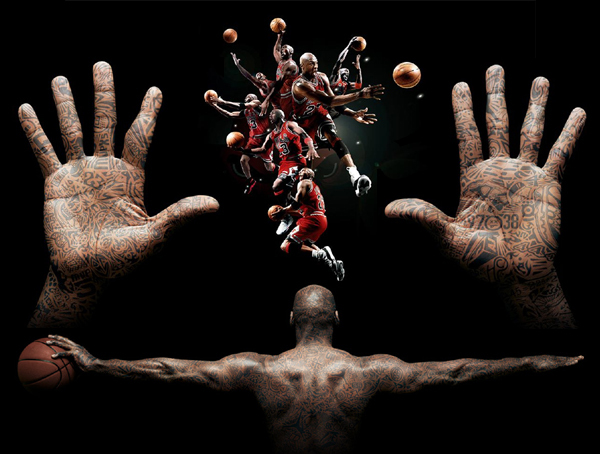 Michael 'Air' Jordan: hands of a basketball superstar! 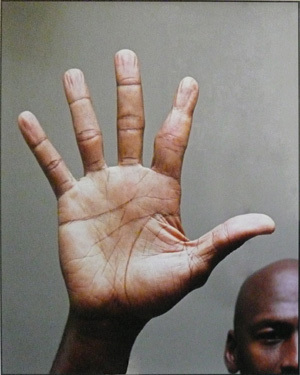 Here's Michael Jordan's hand, much to be considered as the greatest basketball player in history. The disfigured finger is from an injury, I think when he broke it in a game earlier in his career. Not sure where the special marks are, although the breaking of the fate line might be explained by his different careers. Played basketball, retired, played baseball, went back to basketball, retired again, then became execute of an NBA basketball team, then bought part of the team and is part owner, who meddles in the team's operations. He is also probably one of the greatest product endorsers of all time, pushing Nike from what used to be a small sneaker company, a lot smaller than Adidas, which dominated the sneaker industry back then, into the shoe & apparel giant it is today. So there is great charisma also. There looks like something in the mount of apollo, a few lines crossing together. 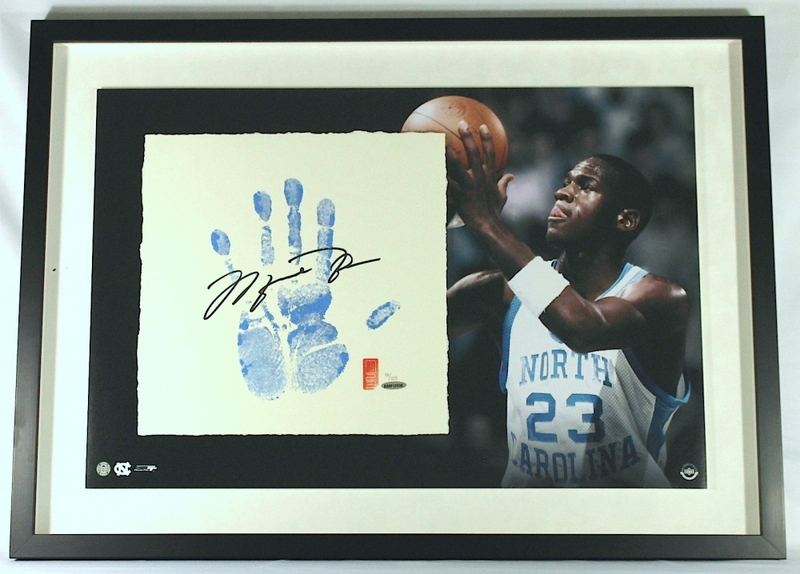 Re: Michael 'Air' Jordan: hands of a basketball superstar! I happened across a better picture of his hand, and noticed that he has a weird fate line, kind of broken in to many different small lines. I've read in many books that people with broken fate line seldom succeed because of lack of focus, whereas some say they keep losing their job, so can't hold on to a career long enough to succeed. What do you think about his fate line? And where does it show his great success? Just FYI, he did retire from basketball after his father was killed, then played baseball, retired from that to return to basketball, then retired after winning championships again. Then a few years later came out of retirement again for a few years before permanently retiring from playing. Now has a new job, part owner, general manager of an NBA team. The other thing I noticed was the V underneath his ring finger. Does that have any significance? One thing I do know is his ring finger is a lot longer than the index finger, which may be why he likes to gamble a lot, in pretty much everything at very high stakes. I know that his dad was killed in a road side robbery, and people close to the NBA say that it was because some unsavory people told him to throw the NBA finals because they had very very big bets against his team (which was a big favorite). But he didn't throw the games, and a few months after his father was killed in what was called a robbery. Does that show up in his hand? jojo400 wrote: I happened across a better picture of his hand, and noticed that he has a weird fate line, kind of broken in to many different small lines. I've read in many books that people with broken fate line seldom succeed because of lack of focus, whereas some say they keep losing their job, so can't hold on to a career long enough to succeed. 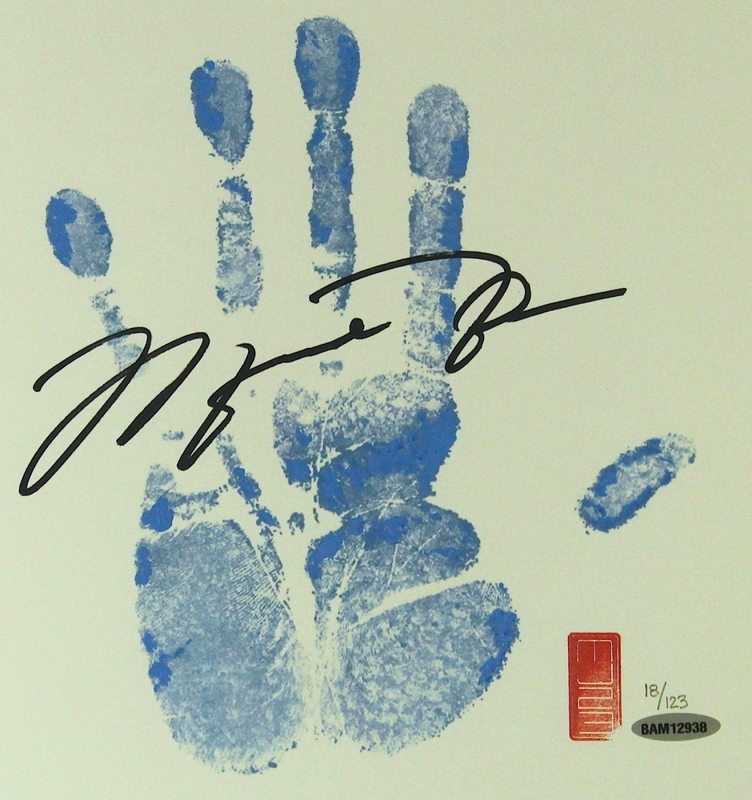 In this hand, I think his success shows in the confident way he easily holds his hand with the fingers nicely spaced. His work shows in his life line rather than fate line. He lives his work, takes it personally. He is his work. The breaks in the fate line appear that the entire line is trying to line up under the ring finger instead. The strong clear branch between the head and heart line shows that when he's in control (mind and heart) he can work hard. Fading in on the other side of the head line and fading out at the heart line shows that control of 'self' is important in performance/action/productivity. The things you mentioned were spot on with his character. Can you explain what specifically in his lifeline makes you say that his succcess is in his life line and fate line (ie. how/what makes it different from an ordinary life line). He definitely lives his work. I remember stories about how he'd always be the first one in the practice facility hours before a game practicing with the trainers and the last one to leave. Then building a half court in his house, calling 2 other teammates to come to his home every day early in the morning to practice their routines for hours. And a whole lot other things. Your mentioning him in control is a very vital part of his life. You're very on point here also. One of the most focused and determined people when it comes to his profession, you can say there are many times when he 'willed his team to win', or 'won the game by his sheer unwillingness to lose'. Same goes for his public image, very in control and making sure his public persona is well knitted, allowing for the enormous amounts of advertising deals (think Tiger Woods before all hell broke loose). Thank you Jojo for the confirming feedback. I wasn't aware of these characteristics of his personality. I did remember his father being killed while parked on the highway but didn't know the details. It's not specifics of the life line per se. It's the balance of it with the other markings. The life force energy dominates. Some people work to live and others live to work. There are few distracting lines or lines that represent being overly sensitive or nervous energy. He doesn't worry what other people are thinking and that comes natural. Would have to make a conscious effort to put himself in other people's shoes (guess that why he got his own brand ) Most of the lines are vertical X like patterns outside of the main lines. Positive upward flow of energy. I think he may have a form of a Suwon Crease which might be a result of how he uses his hands to grip a basketball. The V formation under his ring finger would relate (as I read it) to a pleasure of giving without any expectation of something in return. The straightness and uniform width of his high set Mercury finger & almost equal middle and lower phalange of it, with the top phalange being little longer. Also, its long. In my short experience so far, I have rarely come across little fingers with such straightness and uniformity. The lower phalange of it reflects the relationship & communication with one's own body. He is comfortable there - neither too much into it and not in void of it. He is balanced, comfortable, taking care and addressing its needs. Its length, high set position gives him high ability to be in the communication and having a feeling of being accepted, respectively. He is worth almost $500Million. Where does this wealth show up on his hand lines? It shows in all the strong characters that have been described here. Hi Anand, yes, I agree on it. Thats also a contributing factor for his success. 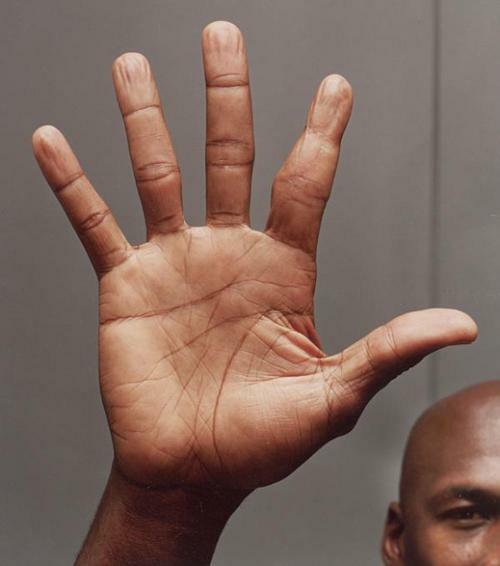 Michael Jordan has very large hands, sources claim that his hand length is reported as: 9.75" (24.765cm), which is really huge relative to his body height of 6ft 6in (or 198 cm). That makes his hand length - body height ratio: 12.5 (compared to 10.8 for the ordinary adult average). Also there are stories about fellow TOP basketball players who describe Jordan to have huge hands, while most basketball players are actually much taller than Jordan. Obviously, it takes big hands to become a basketball superstar! 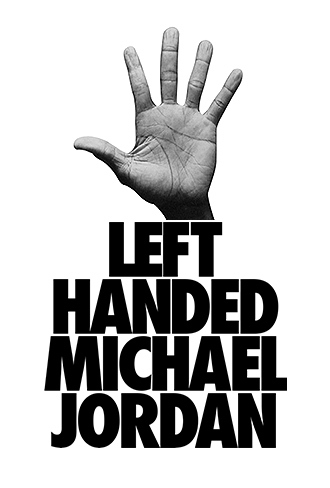 Contrary to what the picture below suggests,... Michael Jordan is actually known to be right handed. 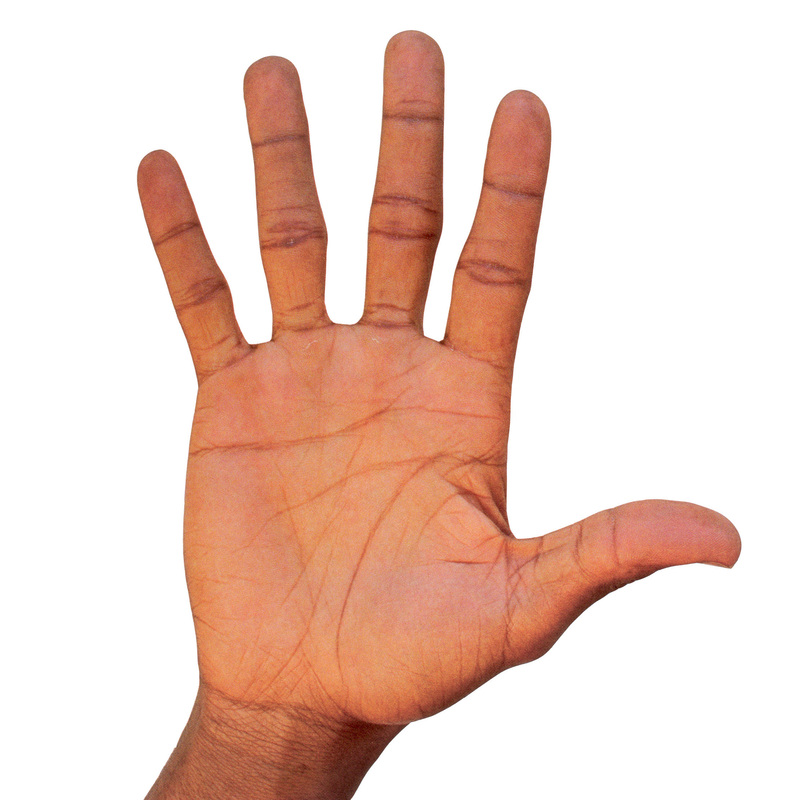 Kawhi Leonard's hands measure 24.892 cm ( = 9.8 inches), though another source (2nd source below) suggests that his hand length is also "only"24.765 cm ( = 9.75 inches). Jarnell Stokes & Noah Vonleh hand length meausure 24.765 cm ( = 9.75 inches), the largest 'hand reach' (from thumb to pinky) was measured for Noah Vonleh to be 29.845 ( = 11.75 inches).